I told you all in a previous blog how I was in California for a week for a wonderful opportunity. California is a wonderful city, full of sun and fun and there are so many places to explore! 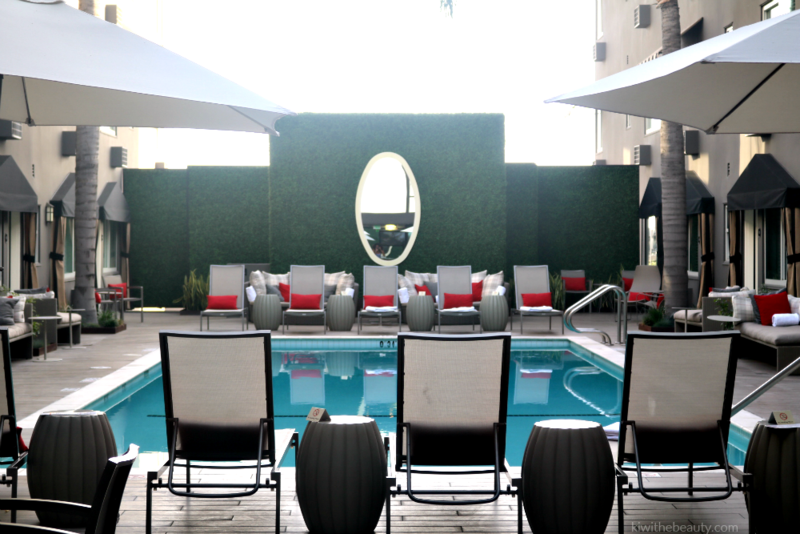 As I was exploring, I stayed at the amazing renovated hotel located in the heart of West Hollywood’s Sunset Blvd called Grafton on Sunset. 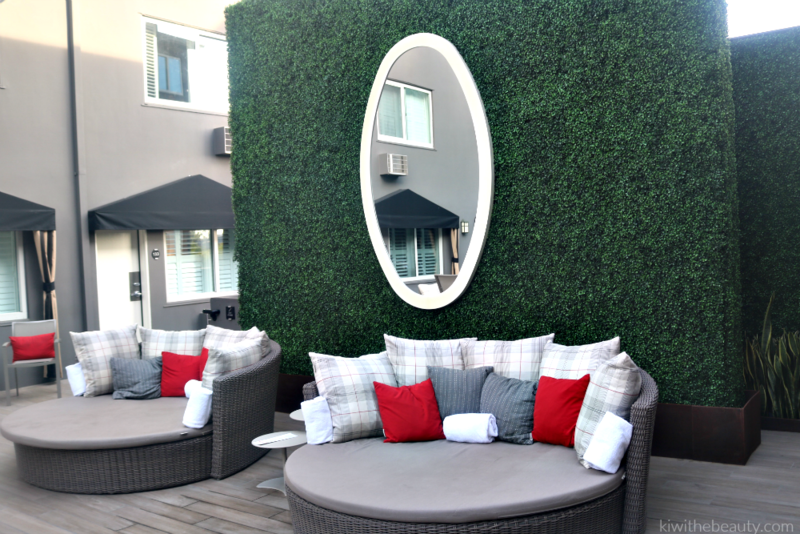 The Grafton at Sunset is located in the heart of West Hollywood and check out my full review of this fun boutique hotel! 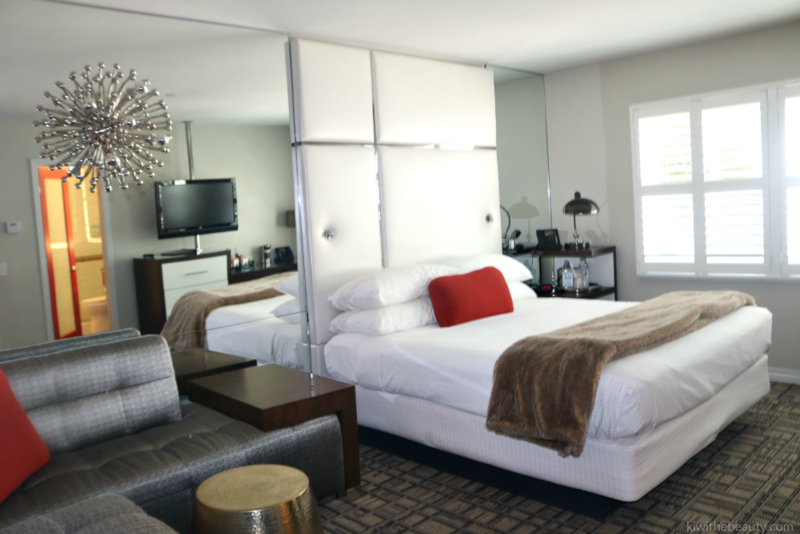 This boutique hotel was one of the most plush hotel experiences I’ve had in a while. 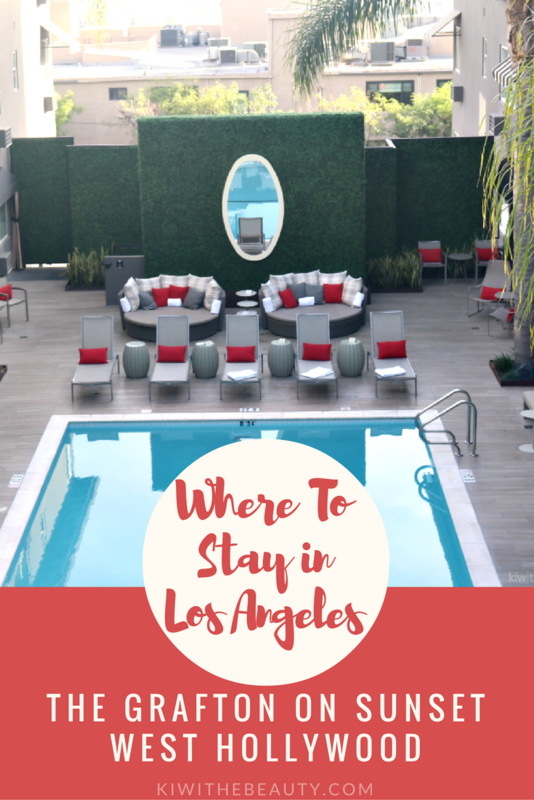 Very trendy, fun and in the middle of the famous Sunset Strip. This is what it looks like immediately when you step inside the door of Grafton on Sunset. The interior decor gives you a taste of the feel of this boutique hotel. Very eclectic and chic with the details and a fun city like feel to the vibe as soon as you check in. 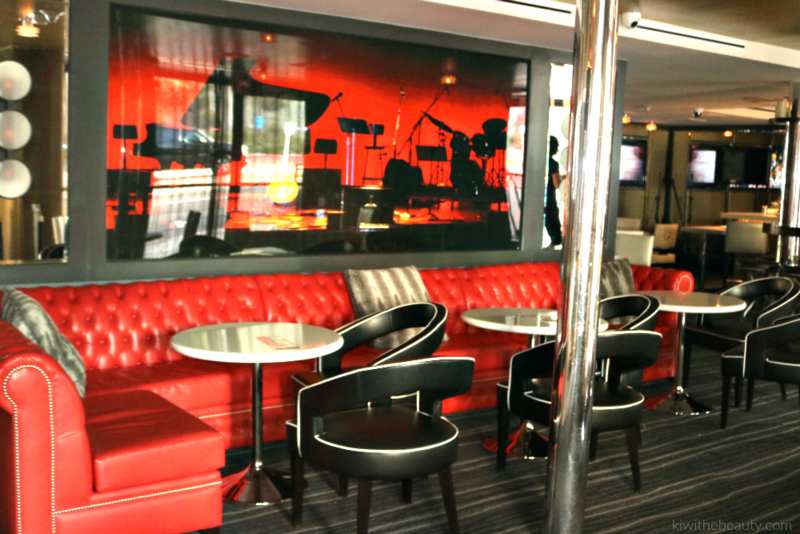 Also when you come inside the door of Grafton on Sunset, you will see this cool dining and lounge area called Bar20, that looks like a rockstar hangout. My plush decor room. The minute I opened the door I felt like I was like a mini celeb getting the rockstar treatment. The walls had a rockstar mural with a babbled light fixture that stood out. The best part was the mini couch. Not too many hotels have a relaxing lounge couch inside the room. Usually you have to upgrade to a suite to get a couch, but this was a standard Queen sized bed room So all the rooms have the couch. Of course I brought my laptop with me as I was doing a little work on this trip. I loved I had so much room to work on my laptop and there was an extra surprise. You know how some hotel have lack of outlets and plugs? Well this room had an additional surprise for people who need the extra outlets. 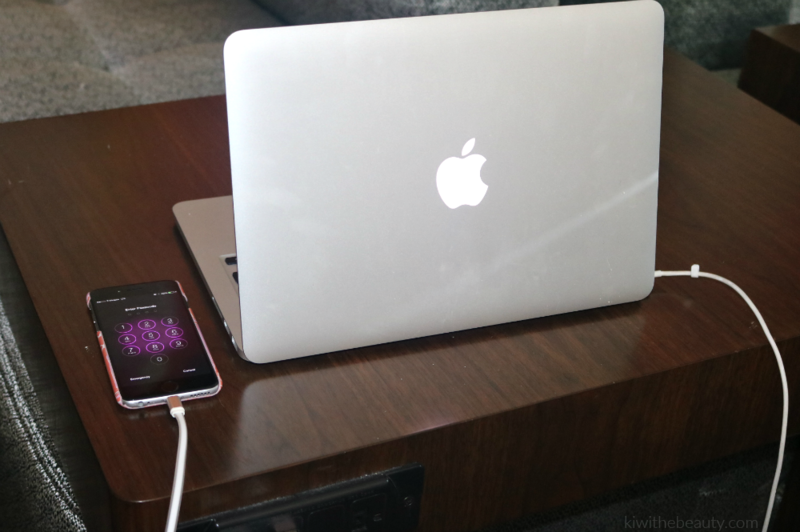 As you can see installed by the lounge couch is a built in desk area with power outlets and usb ports! Any hotel who knows to have USB outlets and ports are keeping up with modern technology and catering to the tech savy consumer. So not only did I plug up my laptop, but at the same time I was able to directly plug my phone to the USB port. This impressed me so much. 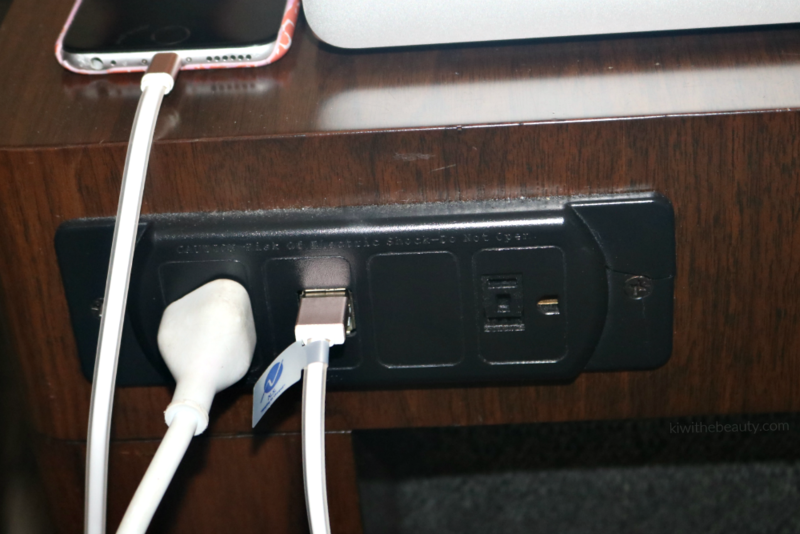 Kudos to you Grafton on Sunset, power outlets for our computers and phones are super important so thanks for go above and beyond to making sure your guest had these options! The bathroom was amazing. 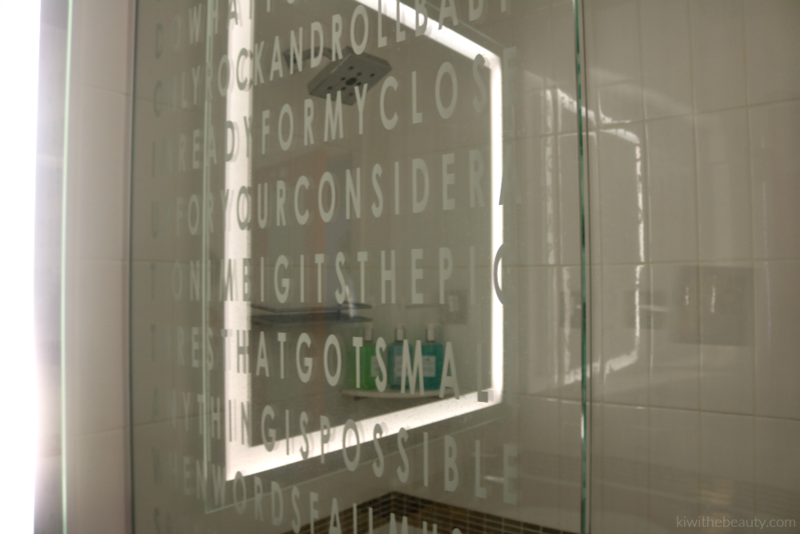 Very modern with radiant florecent lights, motivational quotes on embellished on the glass shower door and a beautiful slanted rainshower head. I always give hotels a thumb up when they have an overhead rain shower installment. I thoroughly enjoyed my showers everyday. 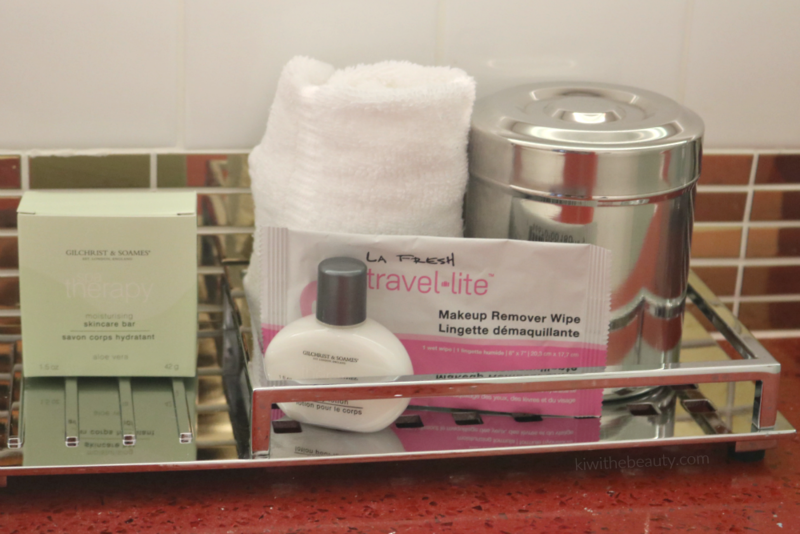 I always pay attention to the toiletries provided in the bathroom and not only did they include just soap and lotion, but makeup wipes, Q-tips and cotton balls (inside metal canister). Another thing I always pay attention in hotels is the toiletries provided by the hotel. 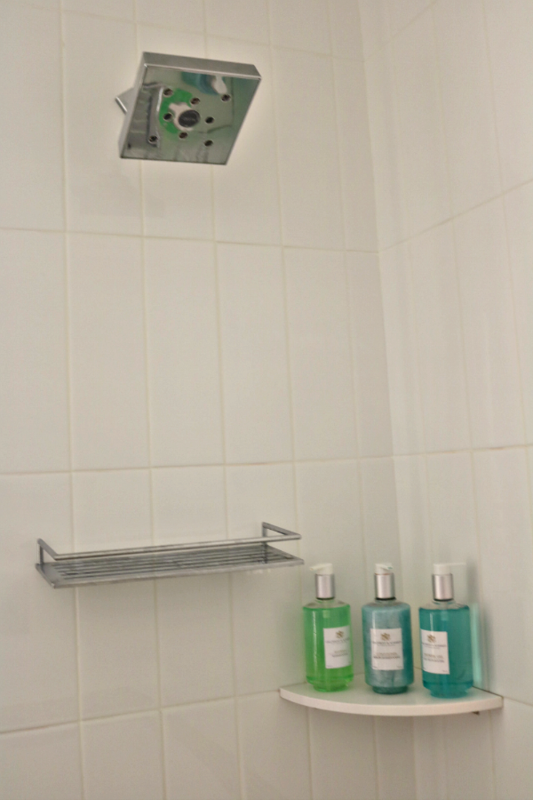 The Shampoo, Conditioner and Shower Gel provided by Grafton on Sunset was very elegant and full sized! To be honest I don’t think I ever saw full sized toiletries in a hotel before. In the picture above, Grafton is thinking of the beauty necessities too! 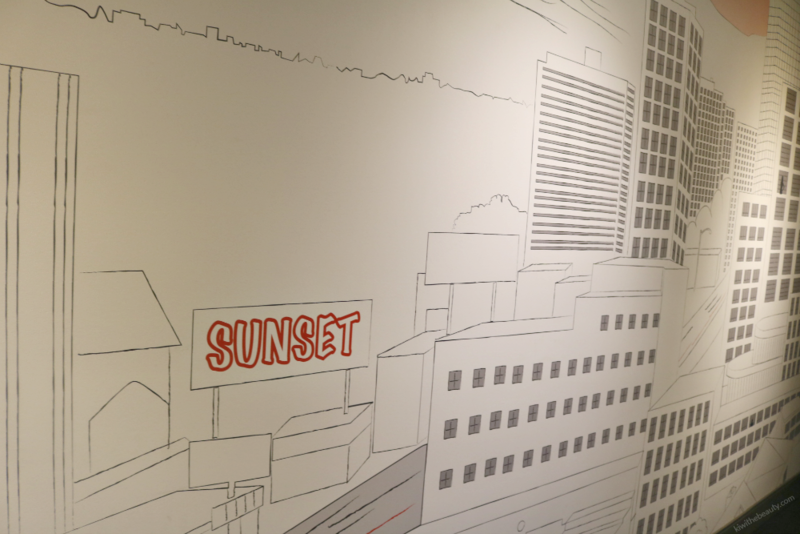 When you walk into the hotel hallways it has it own wall decor of the Sunset Strip minimalistic adorn on the walls. I though that was new and different. Makes the place look more trendy with the wall art instead of regular boring walls. Great touch! The pool are was hands down (besides my plush room) was one of my favorite places to be during my stay. 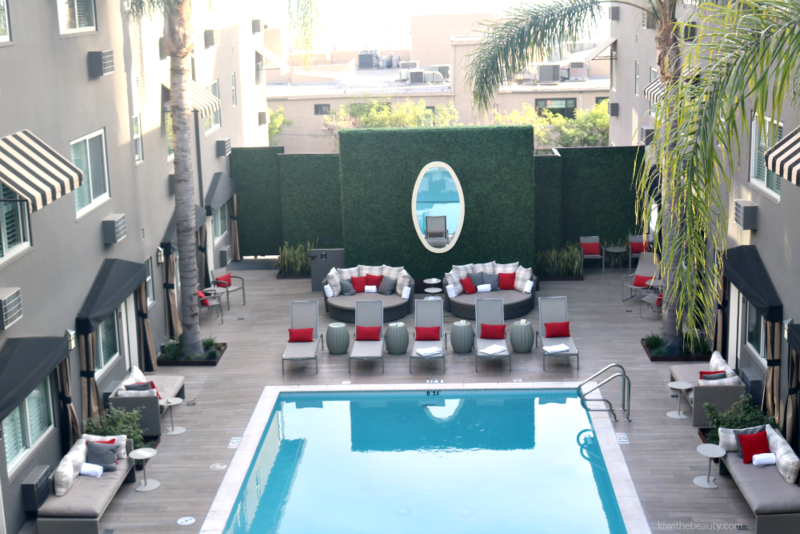 It was so inviting, the exterior decor very modern and fun and the pool was great. 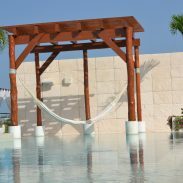 When you come into the pool area they are playing the lastest pop jams, there are fresh towels by every seat and lounge chair and it really wasn’t crowded at all. Sometimes I sat on the round lounge seating and listened to music and relaxed, and then there were times I actually go into the pool. I am not one of those people who think they are too pretty to get in. I am from Atlanta, it was currently cold when I left so I knew I wasn’t going to just sit pretty by the pool. I got in and enjoy the nice beautiful California weather. I didn’t want to leave. I loved the leafy faux manicured backdrop of the pool decor that gives you a semi Alice in Wonderland feel in the middle of Sunset Blvd. 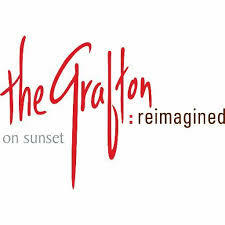 What is also great about Grafton on Sunset is that they have two in-house places to eat, dine and lounge. 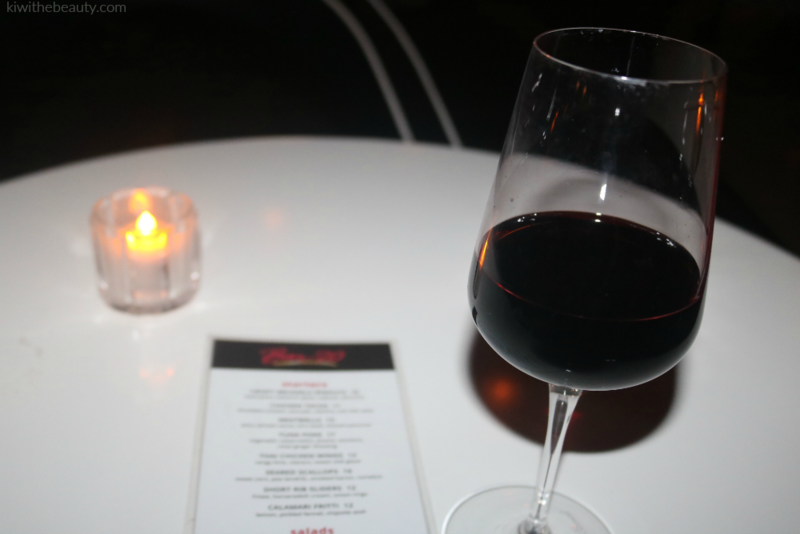 Bar 20 is their chic bar area and Oliver Prime Steakhouse which is their upscale restaurant. I didn’t get a chance to dine at Oliver Prime due to they are closed Sundays and Mondays (I left Tuesday), but I did have a little fun at Bar 20. So first I indulged into their happy hour! Everyday from 3pm-7pm is happy hour on all well drinks, drafts and wines! Drinks are half off. This night they even had a live performer to sing during dining which was a special treat. On my happy hour drink, I decided to get a Merlot drink (Im a red wine drinker). I would of gotten another but I didn’t want to be a lush by myself. I was dining solo at the moment until I met up with friends. So I also decided to order some food off their bar menu before I met with my friends. This was my last night not only at the hotel but in California as a whole, so wanted to see what Bar 20 had to offer. I was actually pretty shocked the range of food Bar 20 had on their menu. It was not too expensive, as Oliver’s Prime has the full menu of more options, but this is great if you are hungry in between your happy hour indulgence. So I got the Cobb Salad to start (which is really a full meal) and Thai Chicken wings. The Cobb Salad is a huge plate so it definitely isn’t an appetizer at all. The Thai Chicken wings were more of the appetizer but I added fries to it to make it a meal. I underestimated how great these wings would taste. If I wasn’t in such a rush I probably would of order a second helping for later. It was that good. 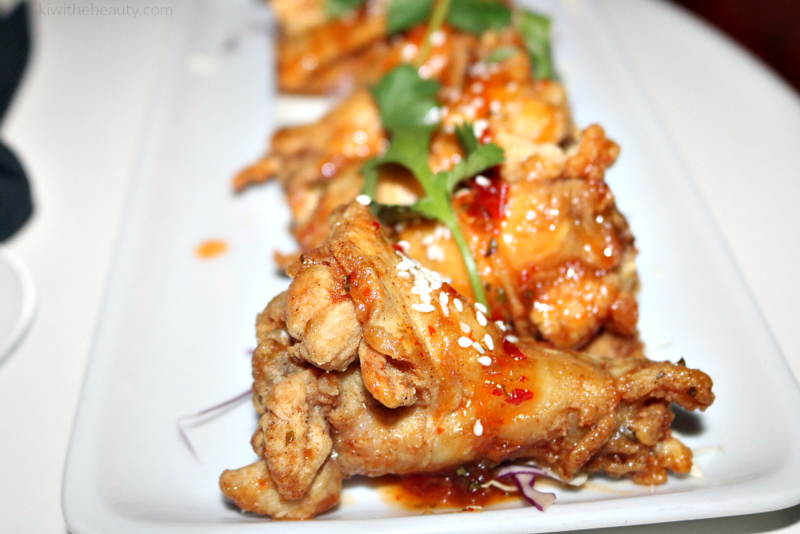 The crispy fried wings with the Thai sauce drizzle with sesame topping just made these wings delish! 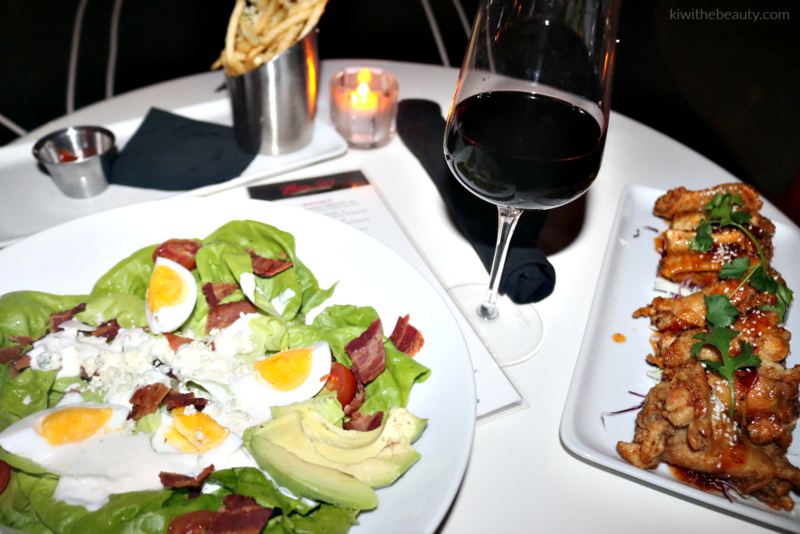 Check out the menu here to learn more what else is delish as a dish at Bar20. 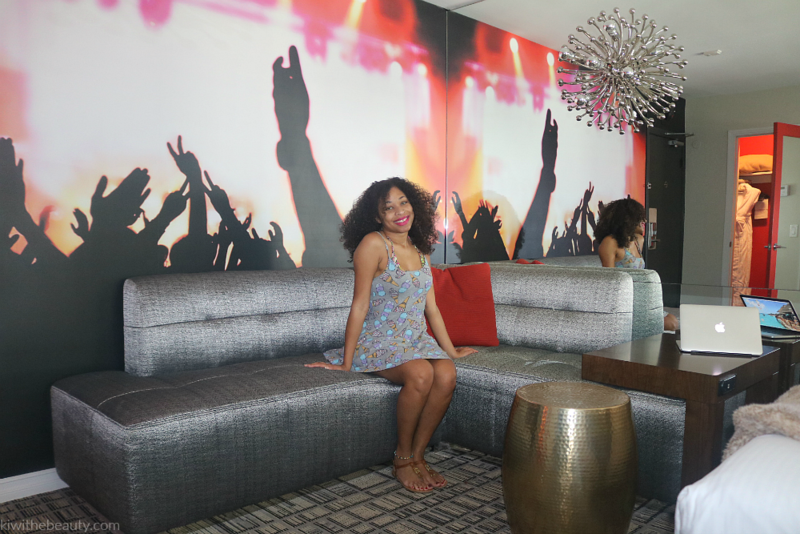 I really enjoyed this chic boutique hotel. 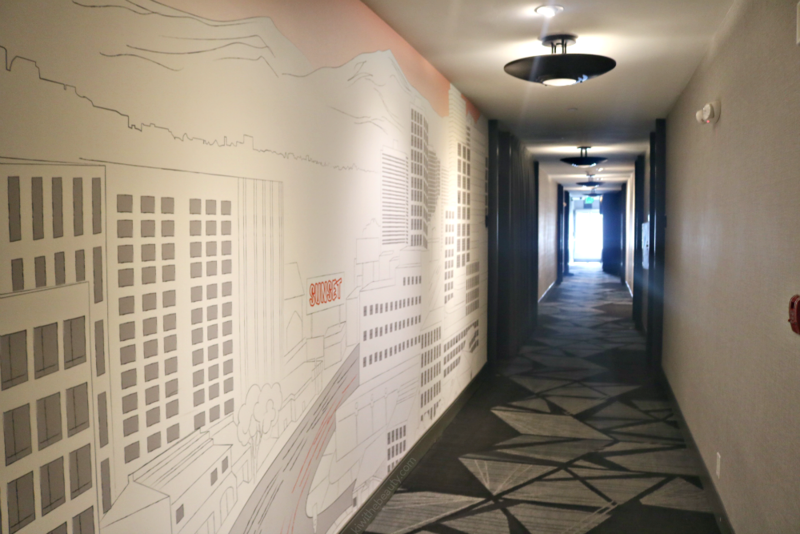 When you think of a hotel it not always just a place you lay your head down, you want a nice getway experience while feeling like its a home away from home. I definitely felt home and super comfy here. If I could move here and pay rent I would. They attention to detail in the hotel made it memorable and it definitely would grant me to be a repeat customer to stay here. Grafton on Sunset is in the right place, plenty of shops and eateries nearby within walking distance and even driving distance. 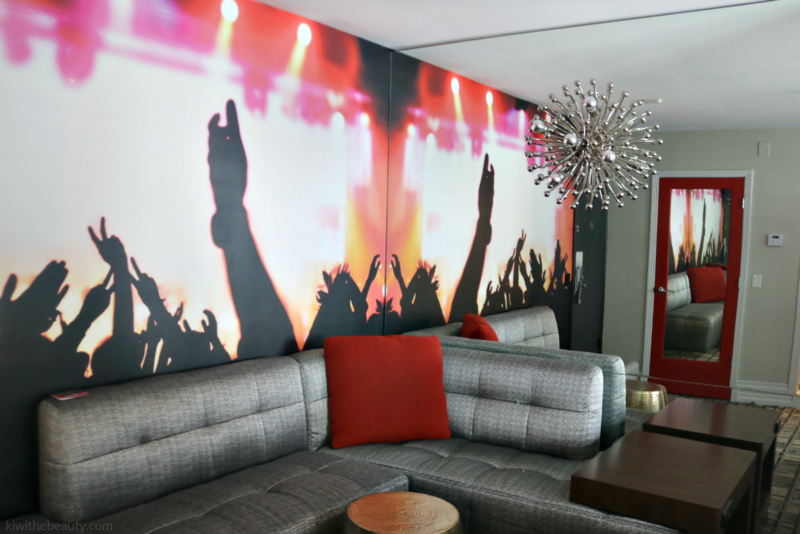 It’s an exciting hotel full of energy and a step up from a regular hotel. If you want an experience in the middle of West Hollywood on the famous Sunset Blvd please stay here. You will have fun! Have You Ever Been to Sunset Boulevard? What do You Think About Grafton on Sunset? That hotel is just gorgeous! I especially love that charging station for devices. Very nice. That sounds like such an awesome hotel. I would absolutely LOVE to stay there someday! This looks like such an awesome hotel. I love the food and the extra plug-ins in the hotel. The Grafton looks like such a great place to get a mini getaway. I absolutely love the decor–wish I was there right now! Everything about this place is incredible. They have a really cool sense of style at the Grafton. What a stunning place to stay! So elegant and fancy! The food looks tasty! Hopefully you had a great time! Thanks for sharing the pics with us! I love LA and West Hollywood. This hotel looks stunning. The color combos and modern pieces are beautiful. I LOVE how modern this is. 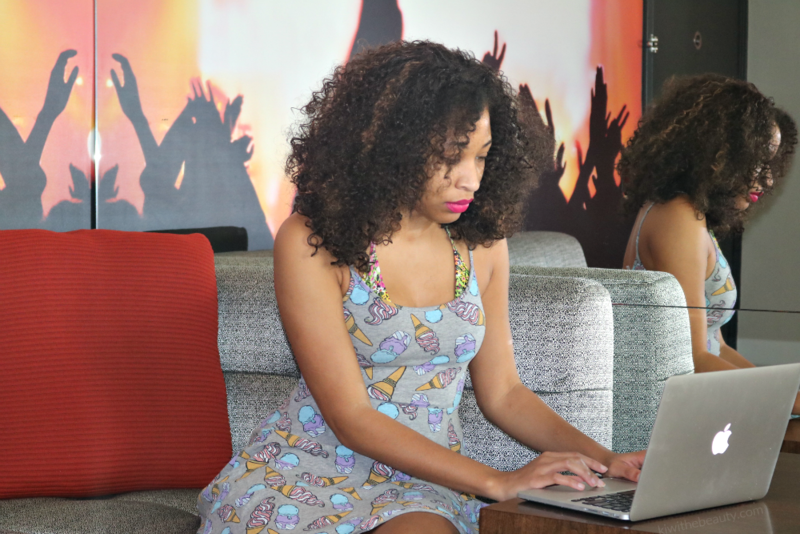 Great decor and perfect hotel for a busy blogger to stay at on work AND family trips! What an awesome hotel!! I have always wanted to go to California and now I know where I want to stay!!! What a beautiful hotel, love the colors and that pool looks sooo relaxing, but then the food photos… oh my! Looks like a place to check out for our next anniversary get away. Ummmm … wow! This hotel looks amaaaazing – and a little different from the Holiday Inns I stay at with my kids on our family vacations. 🙂 So happy you posted! Happy weekend! Kiwi, this is awesome! I am so proud of you, and all the cool events, places and opportunities that you are doing. Keep up the good work! What a gorgeous hotel! California has so much to see & do, but I’d never want to leave the hotel lobby! Wow! This looks mighty fancy. I am planning a trip to Cali in the next year or so, but this looks so much fancier than I’m used to! Would love to stay there! This looks like an awesome hotel! I love the fun décor. I will have to keep this in mind if I am ever in the area. I’m sure it would be easy to get used to rock star style. 🙂 Everything sounds amazing! Wow, I LOVE the decor! What a gorgeous space, I’d love love to do a photoshoot here! This sounds like a beautiful hotel. THe lobby looks so glamorous. I’d love to travel here! What a beautiful looking hotel. I love seeing fun decor like that in hotels, really fun to have a change of scenery. This looks like a beautiful place to stay. I love the design of the rooms. This looks like an amazing hotel. I love the room had a couch and the extra outlets as well. Wow, the Grafton is gorgeous! I love that the decor is so unique, and not the same tired same-old, same-old. I would stay just for the atmosphere! That hotel is amazing! I’d love to stay there. Good food, and how cool is that wall? And the pool? LOVE! That pool area does look pretty awesome – and so crazy to imagine it tucked into the hotel on that street! Love how trendy the whole place looks. Man! This place sounds like heaven. I totally need to stay here one day. It looks amazing and comfortable. Beautiful hotel! I love the decor, pool lounge and the food looks super delicious! I have yet to explore California but I would so consider booking a couple nights at this hotel! What a cool looking hotel! I totally love their decorations and the color combination. I’ve never been to a hotel like this one, it’ll be so fun to experience the place. I have been on Sunset Blvd before but not to the Grafton. 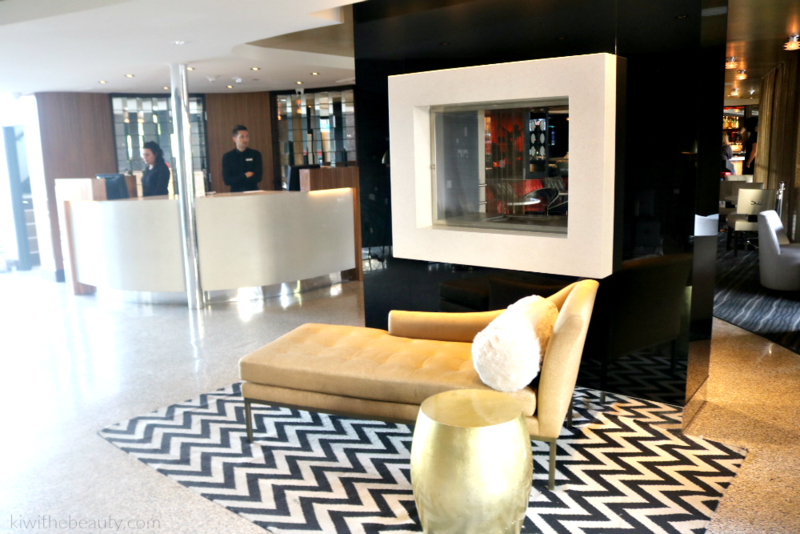 I love the modern features of this boutique hotel!! This place looks very fancy and sophisticated. I love staying in places like this. We’ll go here in the future. I’m bookmarking this for future reference. The Grafton hotel looks like a cozy place to stay. 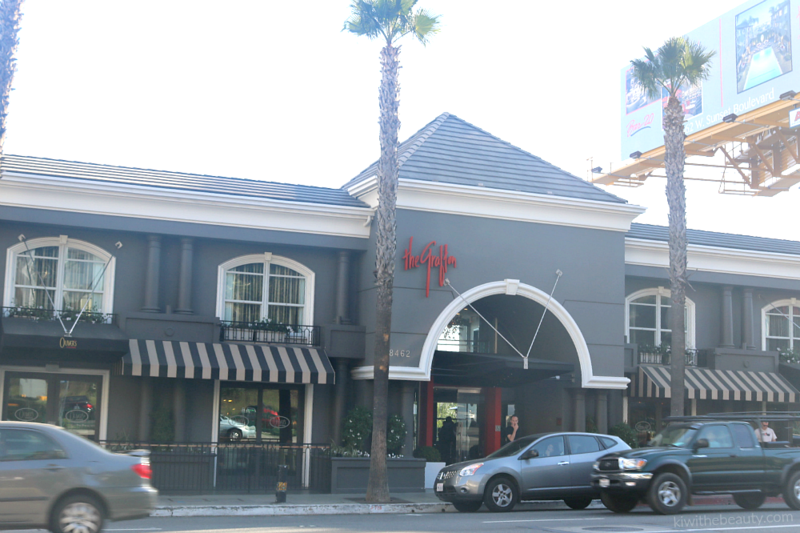 I might travel to California this year, and if time permits and I find myself in West Hollywood, I’d definitely stay in the Grafton hotel. I have never stayed there before, but I’d love to. It is so swanky and unique! This hotel looks gorgeous and so amazing to stay at! West Hollywood is such a fun destination! 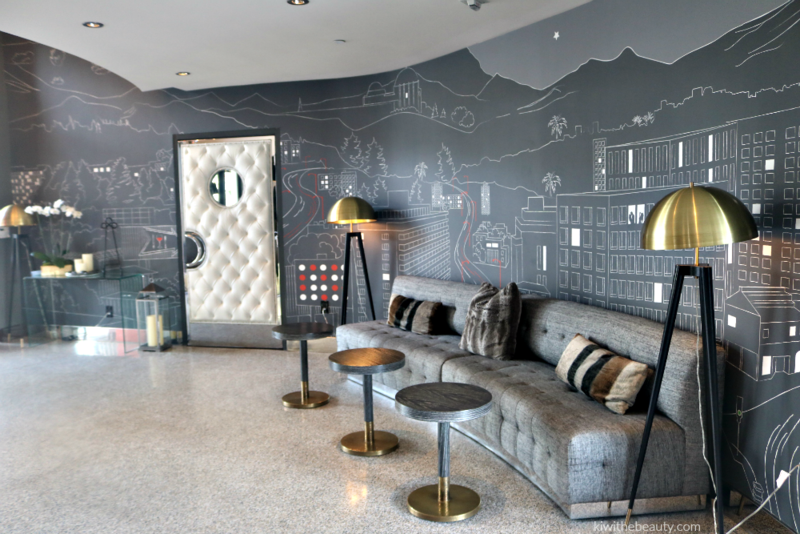 I love how artsy the wall looked on the lobby of the hotel. The bar and lounge area, I bet, is lively at night especially. This is a great place to stay when on a vacation. I love the modern, chic interior and design of this hotel! I know I’d enjoy a visit. And, the food looks amazing.Those Thai Chicken Wings are making my mouth water! I don’t think I’ve ever seen a hotel like that before. Some parts are really pretty and modern looking, while it looks like other parts are really busy with patterns and decor. 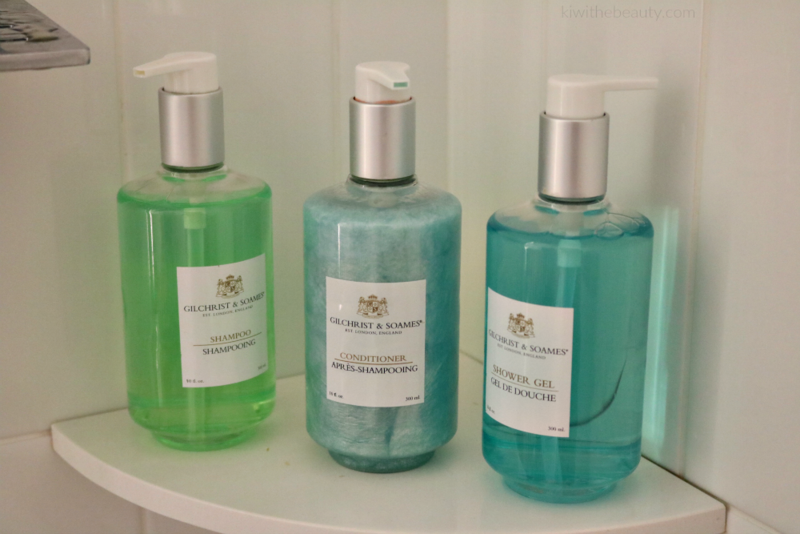 I love it when hotels have the bathroom goodies (the good smelling shampoo, conditioner and body lotion). Sounds like you had a great stay! This sounds and looks like my kind of place for sure. The motivational quotes are a really nice touch. The pool area looks so freaking dope! Such a cool looking hotel. I would love to visit California. wow, love all your pics, so glad that you enjoyed and had fun. This place is gorgeous! I woukd love to stay here one day. The pool looks heavenly and the food looks delicious. I used to live in LA,and lived around the sane area. They did a fantastic renovation job and I’m impressed at how beautiful it looks now. Cool! It looks like a fun and incredible getaway. Thanks for sharing about your experience with this boutique hotel. What fun you had! This is a great looking boutique hotel and the food looks amazing – I don’t think you’d want to leave to go outside! wow this hotel looks amazing. you looked like you had so much fun and everything looks super gorg. I would definitely agree with you! California just has so many places to explore. I’ve visited this place last year and I just don’t have enough time to check out all its corners. I’ll check out the place you mentioned. My goodness, that looks like a wonderful hotel to stay. Stunning colors, good use of technology, great looking interiors & those delicious foods would impress anyone right away. This place looks fantastic! I am in SoCal so I am going to try it out. Thanks so much! This hotel looks so cool! I love it! I haven’t been to LA in years, but the next time we go, I will remember this hotel! Thanks for your review! I always forget how much I enjoy boutique hotels. This one looks amazing! I love the the color scheme throughout the hotel. That pool looks amazing! I love the look of the room. That lounge couch looks so nice. I really love the character and personality of a boutique hotel. They always seem to have little features and quirks that you just don’t find at other establishments. I love the wall décor and interior design of the Grafton. I’ve especially taken a huge liking to boutique hotels wherever I go so I’ll definitely be keeping this in mind! I just love the decor. That looks like a really nice place to stay.